As variegated as it is accomplished, Caroline Littell’s work spans several decades and the multiple continents she visited during her lifetime. Her beautifully rendered photographs, nearly all of them predating the digital era, were taken in countries as diverse in character and terrain as Burma, Botswana, Thailand, Colombia, Scotland, Turkey, Canada, and the United States. Many portray indigenous inhabitants, singly or in groups. Others depict landscapes, public squares, churches, monuments, and wild animals in their natural habitats. Diverse as they are in subject, however, the photos evince two consistent qualities, which together convey a strong sense of presence, whether the subject is a rhino in Tanzania or two young men astride their motorbikes on a street corner in Bangkok. On the one hand, the photos achieve, time and again, an effect of spontaneous immediacy, akin to that of a snapshot. Unstaged and uncontrived, they capture a fleeting moment just as it was. In one stark but subtle photo, taken in Metsovo, Greece, two elderly women in black headscarves and long black dresses climb a sidewalk against the backdrop of a white stone wall. One follows the other, but although they are in step, each appears engrossed in her own thoughts. Here as elsewhere, the photo creates the sense of the moment unfolding, unhindered by the medium or the will of the photojournalist to control what she is encountering. At the same time, Littell’s composition is artfully balanced. And even in her most kinetic images, a sense of the transitory moment is countered by a feeling of sustained attention. That is particularly true of her panoramic renditions of unpopulated landscapes, which range from the Scottish Highlands to the Sussex Downs to a snowy field in Alfred, New York. Viewing these tranquil images, their quietude enhanced by their monochromatic medium, I am left with an impression of steady, unhurried observation. Of the many photos that join a sense of the world in continuous motion with that of poised, relaxed attention, one of the most memorable is a picture of fishermen in a boat on Inle Lake in Myanmar, formerly known as Burma. I first viewed this photograph in the late 1980s, when it appeared in print in conjunction with a travel article by Alan Littell. The image impressed me at the time, and viewing it again, nearly thirty years later, I find it no less compelling. Against a faintly discernible horizon obscured by a dense mist, three Burmese fishermen are at work on narrow boats resembling dugout canoes. Two are attending to large conical fishing nets. Closest to the camera stands an oarsman, his left foot planted on the stern and his right leg curled around a tall wooden oar. He appears to be rowing–or about to row–the long boat with his leg, as is the custom on Inle Lake, where the heavy vegetation on the water makes a seated rowing position impractical. The oarsman’s dark reflection shimmers in the slightly rippling water. Although the boat appears to be in motion, and the men are busy with their labors, this symmetrical, unruffled image is imbued with a mood of contemplative calm, reminiscent of Asian minimalist painting. Though firmly embedded in time, it has the timeless character of a haiku. “What you look hard at,” wrote the poet Gerard Manley Hopkins in his journal in 1871, “seems to look hard at you.” As her choice of subjects indicates–she was an explorer and documentarian, not an investigative journalist–and as her posthumous exhibition amply demonstrated, Caroline Littell’s approach to her subjects was more intuitive than hard, more empathic than interrogatory. But in her unending curiosity, her openness to experience, and especially her capacity to wait for the instant when the character of a person, place, or thing might disclose itself, she allowed her subjects to speak for themselves. Patiently present for the world’s ephemeral forms, she made them vividly present for her viewers. * Molly Steere, summer assistant at Herrick Library, helped to install the exhibition, which ended on July 16. The photos will eventually be available in a book compiled and edited by Alan and Harry Littell. 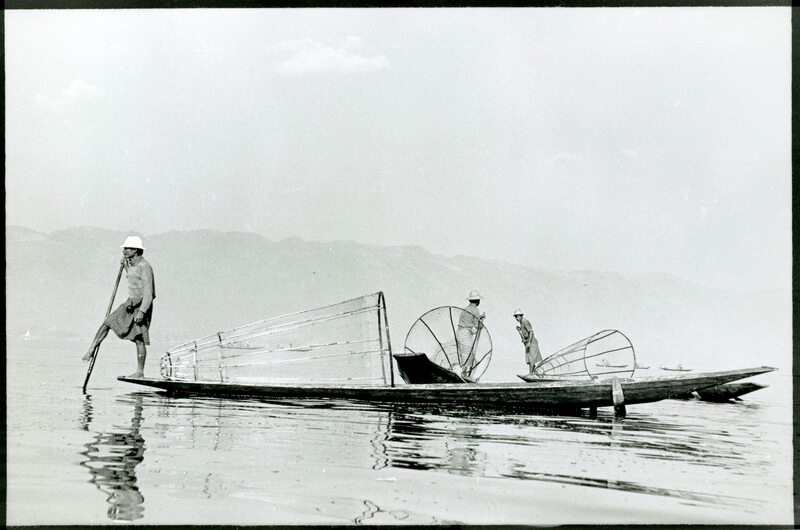 Photo: “Inle Lake,” by Caroline Littell. I’m sorry I missed Caroline’s show. (I didn’t know about it.) I enjoyed reading your comments, especially those about the photo of the Burmese fisherman. I’ve owned a copy of this photo since the mid-eighties, and I never tire of looking at it. I love its quiet power and flawless composition. I’m looking forward to the book of Caroline’s photos that Harry is putting together. I miss her, and it will help fill the void. Thanks for your comments, Mike. I too have a copy of this photo, and my feelings about it are congruent with yours. Camera Without Borders, a collection of Caroline’s photographs edited by Alan and Harry Littell, is in production and will soon be available.